Fr. Stephen De Young finishes the discussion of Acts 15. Fr. Stephen De Young begins the discussion of Acts, chapter 4. Fr. Stephen continues the discussion on Acts, Chapter 17. Fr. Stephen De Young continues his discussion of the Acts of the Apostles, Chapter 4. Fr. 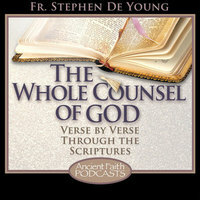 Stephen De Young discusses the Acts of the Apostles, Chapter 5. Fr. Stephen De Young discusses Acts 11 and 12.